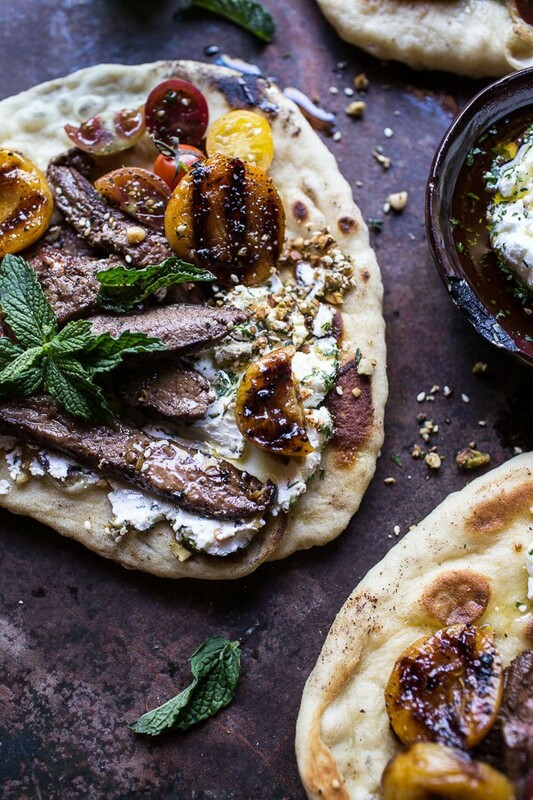 Cause really, naan makes every meal just THAT much better. Especially homemade naan, which I have deemed one of my best recipes ever. It’s also one of the blog’s most popular recipes ever, even though I posted it almost two years ago! Just ask my mom, she basically BEGS me to make it any chance she gets. It’s just amazingly good. Also, you know what else is really good? Lamb! I never cook with lamb, but ever since I made lamb roast over Christmas for the fam, I have been itching to try out some new recipes. Not sure why it took me so long to actually try them, but maybe I just knew I needed to wait for those fresh summertime apricots…they kind of make the recipe. 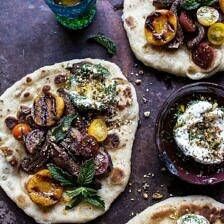 I think any stone fruit would work, BUT, I’m really into apricots, to me they feel very middle eastern, I think they fit really well with this recipe. 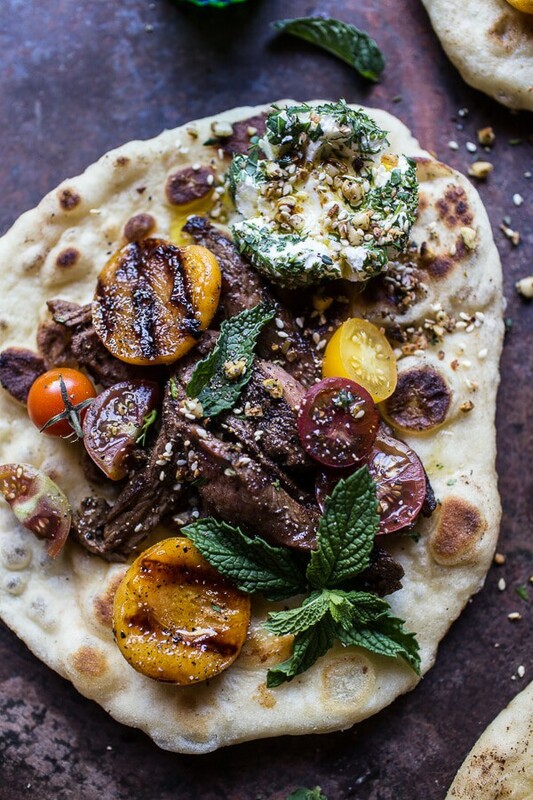 So this grilled lamb tikka with caramelized apricots is so simple, quick and easy. If you are not a huge fan of lamb, steak or chicken can work as substitutes, but I recommend giving the lamb a go. Promise, it’s not as scary as some of you may be thinking!! Ok, but let’s talk about this labneh. Labneh is literally just thickened yogurt and it’s also incredibly delicious. It can be served thick, like Greek yogurt, or super thick, like cream cheese. I went with the cream cheese consistency, but if you are short on time and do not want to wait a day for the yogurt to thicken in the fridge, you can just go for the Greek yogurt consistency. Still delicious. 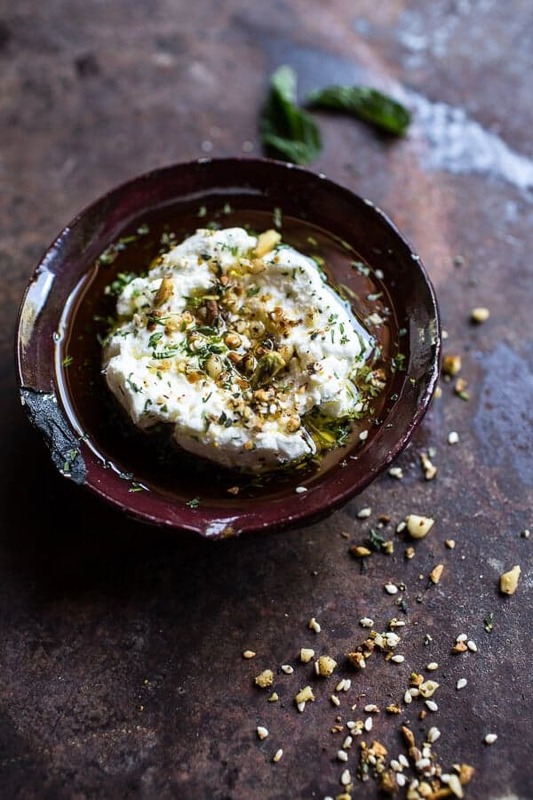 My favorite part about the labneh though is that it gets soaked in olive oil, rolled in fresh herbs and then sprinkled with thyme toasted pine nuts, pistachios and sesame seeds. I mean, doesn’t that sound good? The lamb steak gets coated in a coconut tandoori mixture. Then you simply throw it on the grill, slice and place it on some fresh naan. 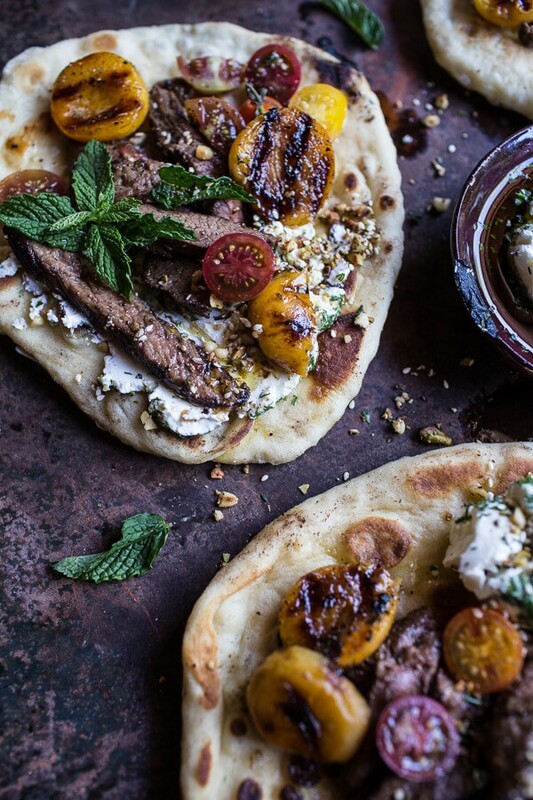 Then just add those pretty caramelized apricots, some fresh mint + tomatoes and a hefty serving of Labneh… and DONE. Oh and pretty healthy too, got to love when that happens. Whoa, I just got right down to the point today. No rambling…sorry, I was a little distracted. The family Group Me (cool app) texts have been going off like crazy today and they are all about Christmas, so you know I cannot help but to participate. Apparently tickets are crazy cheap right now, so everyone is trying to buy theirs…a little too excited. I am Christmas freak. Live with it. And I think that’s kind of all for today. I have a cake chilling out in the fridge that’s just waiting to be photographed, so at the moment mind is petty focused on how to get shots of this insanely delicious cake. I love photographing pretty things, hopefully this cake will be one of them. BUT you do absolutely have to make this dinner. It’s perfect in every which way and I think you’ll love it! 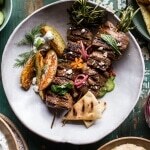 So this grilled lamb tikka with caramelized apricots is so simple, quick and easy. If you are not a huge fan of lamb, steak or chicken can work as substitutes, but I recommend giving the lamb a go. Promise, it's not as scary as some of you may be thinking!! In a bowl, mix together the yogurt, lemon juice, lemon zest and a pinch of salt. Place a sheet of cheesecloth or a thin kitchen towel in mesh strainer. Pour the yogurt mixture into the cloth and bring the edges of the cloth together at the top. Tie together the ends of the cloth, so the yogurt is closed inside. Place the strainer over a large bowl and place in the fridge overnight. If you are in a hurry, you can skip straining the yogurt and just use the Greek yogurt as is, not a huge deal!! 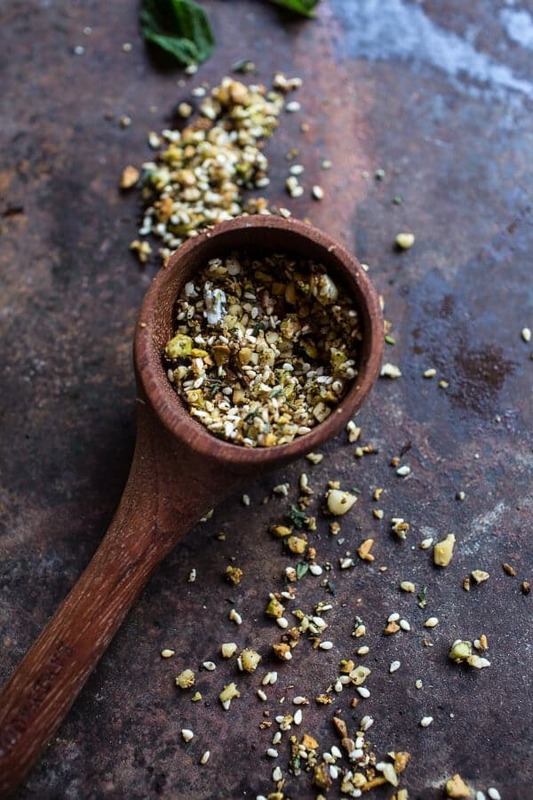 Meanwhile, add the pine nuts, pistachios, sesame seeds and thyme to a skillet. Cook until toasted and fragrant, about 3-5 minutes. Season with salt. When the labneh is ready, remove it from the fridge and roll it into balls. Roll each ball in the chopped herbs and then place in a bowl and cover with olive oil. Keep in the fridge until ready to serve. Place the lamb in a gallon size ziplock bag or a 9x13 inch pyrex. Add the tandoori paste, coconut milk, sesame oil, smoked paprika, salt and pepper. Massage the marinade all over the lamb steaks. Let sit for 20-30 minutes or up to 6 hours in the fridge. When ready to grill, preheat the grill or a grill pan to high heat. 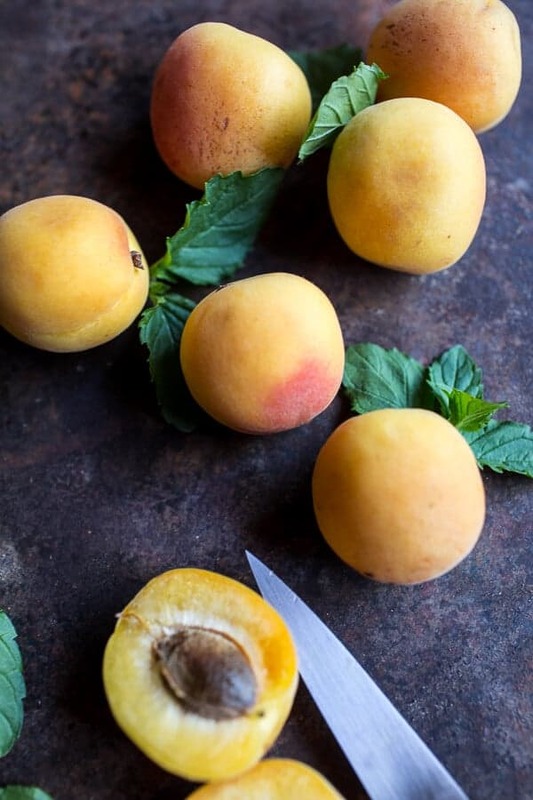 In a bowl, toss together the apricots, honey and balsamic vinegar. 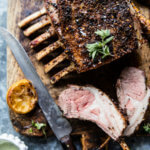 Place the steaks on the grill and grill about 5 minutes per side (cooking time will vary depending on the thickness of your lamb) or until your desired doneness is reached. Remove from the grill and allow to rest 5 minutes before slicing the steak thinly. Meanwhile, rub the grill with a little oil if need and then add the apricots. Grill for 3 minutes per side or until the apricots begin to caramelize. Once grill marks begin to appear, you will know they are ready. To serve, place a piece of naan on a plate. Add the slices of lamb and then the apricots. 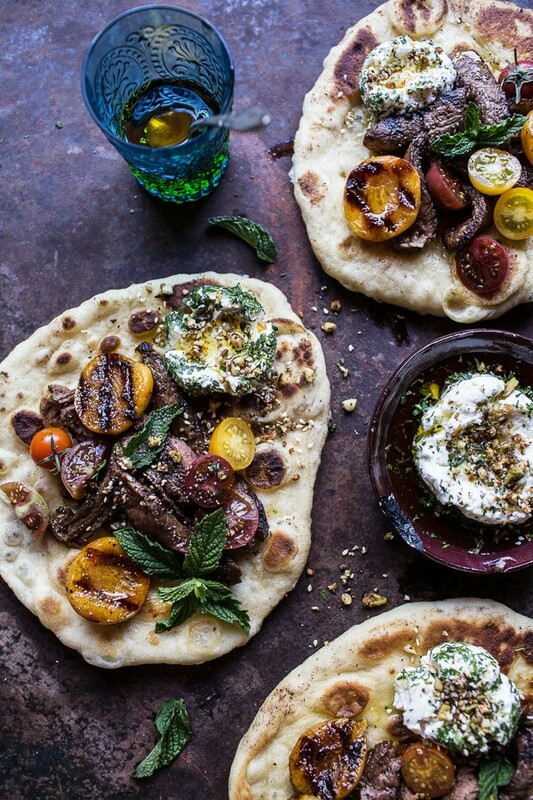 Place a few labneh balls on each piece of naan and sprinkle with the pine nut/seed mixture. Drizzle with olive oil and then add fresh mint and cherry tomatoes. EAT! *If you are in a hurry, you can skip straining the yogurt and just use it as is, not a huge deal!! Plus, you get to eat naan. That should scream to you that you MUST MAKE THIS. Duh. 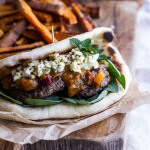 Moroccan Spiced Lamb Burgers with Apricot Chutney + Pistachio Feta Pesto. Naan has got to be my favourite bread! 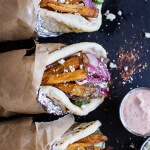 Love the middle eastern flavours you have used here! Lovely recipe! Beautiful photography, as always! I’m also a Christmas freak. And a Lamb Freak and DEFINITELY a Naan freak! This dinner is basically my hopes and dreams in edible form and I NEEDS IT NOW> Pinned! Hi Tieghan! This is incredible. I have been wishing to try making labneh out of non-dairy yogurt and adding mint. And I will certainly try it atop your naan! What cut of lamb steak did you use?? HI Cori! I just used what was labeled lamb steaks at my grocery store, but I believe they where just the chops. Hope that helps! 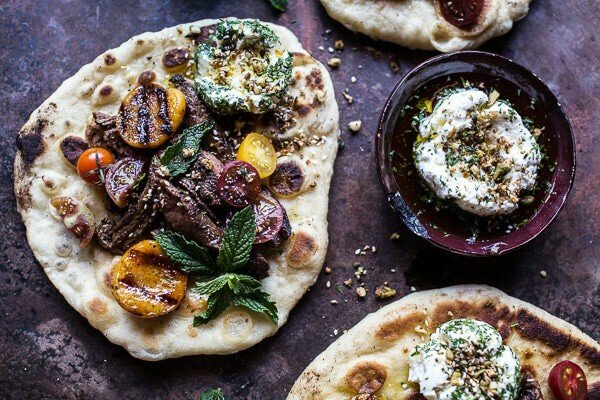 I’m actually allergic to lamb but I can see this recipe being equally delicious with grilled steak. Also, labenth is my new favorite food – it’s so tangy and fresh! I use your naan recipe all the time, it is fantastic! Can’t wait to try this recipe out with the next batch. I never cook with lamb either, not sure why, because it’s something I love. Looks wonderful! You seriously make me want to make everything and anything you make. And I don’t even like lamb. But I feel like I’d devour this. GURL. You rock. Just a tip, you can also buy some ready made labneh from middle eastern stores, if there are any near you. Labneh is a middle eastern breakfast item, so if you do end up buying the premade stuff and have any leftover, you can try adding some minced fresh dill, chopped walnuts, and some garlic powder and smear it on some fresh pita. This was actually an appetizer I had a Turkish restaurant. Tieghan you are awesome! I am totally in love with your blog and recipes! I so wish this was for dinner tonight, what fab flavors! Yum, middle-eastern is my favourite! We were in Turkey recently and they use SO MUCH lamb there – pretty much had it every day. A labneh style yogurt was also served with almost every meal, so you are right on point with this! Love the caramelised apricots, pine nuts and mint too – such amazing flavours. Looks so good. Unfortunately in the southern hemisphere apricots are not in season. Do you have any other fruits you would recommend using? Hi! Really any fruit will work. Apple, peaches, figs, dates or even dried apricots. Does that help you? You just want a fruit that is sturdy enough to cook. You could also just sup apricot jam too! These look amazing!! I LOVE tikka! What would be your best recommendations for making this in advance for a party? It sounds amazing! I think you can prepare the lamb in advance and then just grill before serving. The labneh can be made up to 3 days ahead. Let me know if you have questions. Hope this is a hit!